This was one of the more impressive (to me) orchids from this year's show. 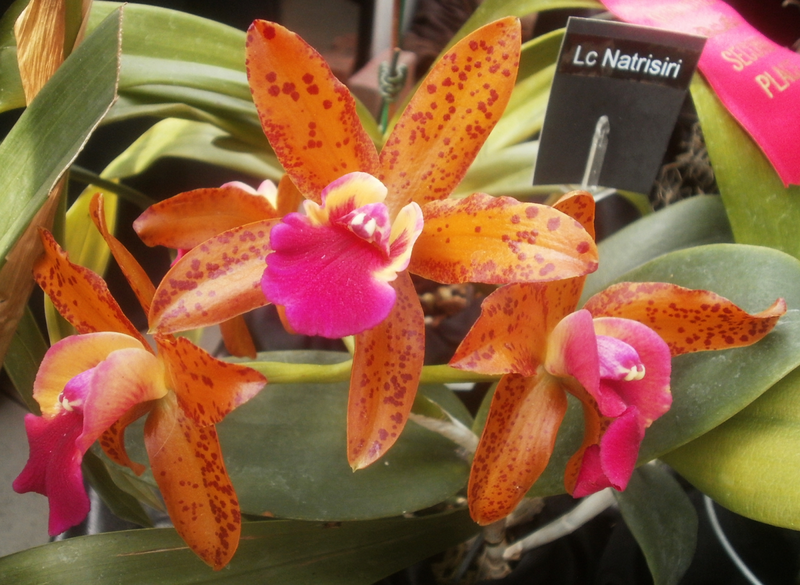 The others were Cattleya-types as well, which is notable mostly because I'm usually more impressed with the lady-slipper (Phragmipedium and Paphiopedilum) types. I couldn't find any results for this plant in the orchid registry or on Google, so either the name is misspelled, or this is one of those rare cases where a thing exists but has for some reason not made it to the internet yet. Considering this show's history with spelling, I'm betting on the first option. As you have probably guessed, I've started spraying the "white oil" on the plants in the basement (as of August 4). This leaves me basically no time to do anything else, so I'm not doing anything else. 1) It is very messy. Oil and soap and water gets everywhere. I'm still doing it inside, because . . .
2) It's also very time-consuming. Watering a round of plants (bring plants to the tub, put plants in the tub, water, drain, take plants out of tub, return the plants to their original location) normally takes me about 15 minutes. Having to bring every plant to the tub means more trips, and then spraying all surfaces of every plant makes each round of watering take longer, so watering is now happening at less than half the usual speed. Taking the process outside would only serve to make a time-consuming and messy process more so: having oil, soap, and water dripping on the plant room floor is the lesser evil. 3) Emulsification is totally real, you guys. When I started the whole process, I had the oil and the dishwashing liquid in a milk jug, and I shook the jug around to mix the two together, and they mixed, but the mixture wasn't stable, so by the time I was ready to dilute and spray a new batch, the stuff in the jug had mostly separated into two layers again. When it was freshly shaken up, it poured pretty much the same as the oil -- noticeably thicker than water, but not by very much. At some point, though, I shook it up and it thickened into something very different, roughly the consistency of mayonnaise (which is also an emulsion made of about 70-80% vegetable oil, water, and an emulsifier1), yogurt, or thick shampoo. Pourable, still, but much slower, and it sticks to the measuring spoon terribly. That's gotten a little thinner over time, but it's still very different from the oil I started out with. White oil concentrate (left) and in the spray bottle I actually use (right). 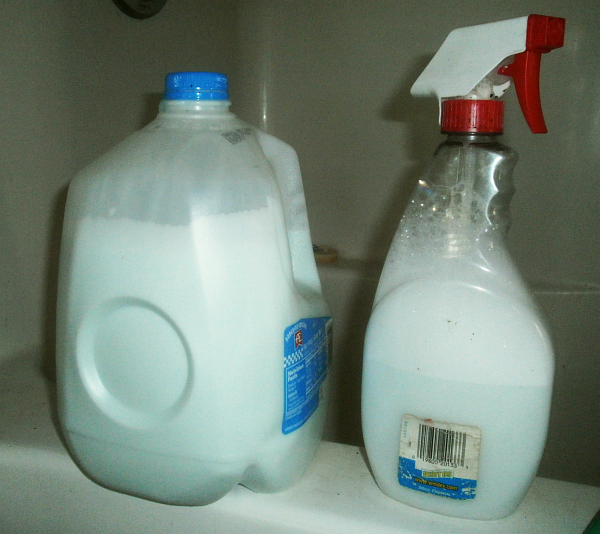 4) I'm also using roughly three or four times more of the oil/detergent mixture than the recipes I found on-line recommended (I'm using 3 Tbsp in a little less than a quart of water; they recommend 1 Tbsp in a full quart), because after a few test sprayings on a Gasteraloe, I wasn't convinced that there was enough oil in the spray to be accomplishing anything. It is possible that this will turn out to be a disastrous decision, but the plants haven't reacted badly so far, aside from the Breynia disticha, which may have been having other problems. 5) And I'm still seeing new thrips and scale, though I wasn't necessarily expecting them all to vanish like magic at the first application. Not sure I expecting them all to vanish ever, as far as that goes.2 But I am having a more difficult time locating thrips, if not scale, so maybe progress is being made. 6) Because of the slowness and messiness, posting is likely to be light for the next couple weeks, as much of my free time will be spent drunkenly sliding around on the plant room floor in a pool of soybean oil and soap,3 and/or cleaning up from same. There'll still be orchid posts every five or six days, unless I forget. 1 The emulsifier in mayonnaise is egg, not dishwashing liquid. Or at least it's not dishwashing liquid in your better brands of mayonnaise. 2 There's a post to be written, sometime, about the claims I found in a number of sites that were pushing the white oil, that because the oil wasn't a chemical, and because it works by suffocating the insects, there was no way they could evolve resistance to it. Sadly, that is not the case: 1) any atom, whether alone or in combination with other atoms, is a chemical of some kind or another. Vegetable oil is not an exception; it just happens to be one of the chemicals that we can eat large quantities of safely. 2) No, thrips are not likely to evolve beyond the need to breathe oxygen, but they can still evolve resistance to white oil. If I ever get around to writing that post, I'll describe some ways that that could happen. But don't hold your breath, no pun intended.